Building bases, managing resources, and fielding an army; these are things I cannot do. Matching three or more gems together? Welcome to my world, StarCraft players. 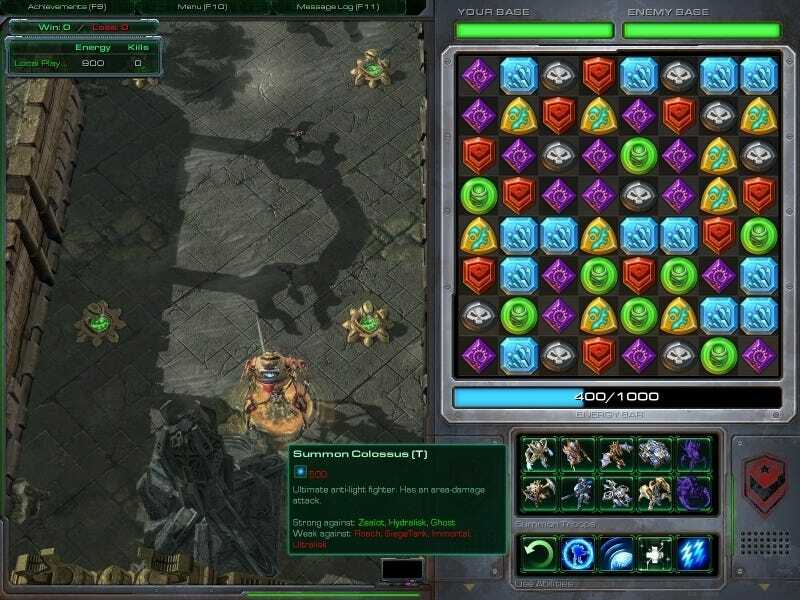 StarJeweled is one of four new official game types coming from Blizzard to StarCraft II as a way to highlight the amazing flexibility of the game's modding tools. Along with Left 2 Die, Blizzard DOTA, and Aiur Chef, these games will serve as a gateway for players into the realm of player-made mods. Each of the four has its charms, but StarJeweled is the one that caught my eye. The more seasoned StarCraft II player looks at the map and immediately knows what needs to be done. He knows what resources he needs to build. He knows the choke points where a few troops and defenses can go a long way. I look at a StarCraft II multiplayer map and I see my inevitable defeat. I look at StarJeweled's playfield and I see hope. You see, in StarJeweled, your resources are tied to a Bejeweled-like gem matching game. The more matches you make, the more resources you have to deploy troops. As you make matches, a steady stream of marines make their way from your base up a small corridor on the side of the screen towards your enemy's base. Meanwhile the enemy is doing the same, though hopefully not with as much skill. It's not just luck and Bejeweled skill that makes a win in StarJeweled. Each player has a selection of units and powers they can activate using the points they amass in the gem-matching game. Players still need a working knowledge of StarCraft units and skills, so they know what units to send when. Should they reserve points to heal their units, or just spend them all on one giant rush? When you've got mad Bejeweled skills, strategy doesn't matter quite as much. A constant stream of points equals a constant stream of troops. My AI opponent didn't stand a chance. For the more casual friendly gamer, the experience is blissful. It's a tiny version of Puzzle Quest meets StarCraft II, and I can't wait to play more.